On 21 March 1914, Lembede was born into a peasant family living on the farm in Eston in Natal. He was baptised as an Anglican. His father, Mbazwana Martin was a farm labourer and his mother Martha Norah MaLuthuli Lembede, a teacher, who taught him at home until he completed his elementary education. In 1927 after completing his elementary education his family relocated to KwaMphepheta in Mbumbulu. One of the reasons for the relocation was that Lembede should get a formal education. Before his family relocated he converted to Catholicism with the Church playing a pivotal role in shaping his life. He started his formal school at the age of 13 at the Catholic Inkanyezi School. Because of his excellent performance in class, his teacher would teach him a lesson and later have him instruct others. He was passionate about his studies and more often than not, would be found engrossed in his books, even while herding the cattle. After completing standard three, Lembede worked briefly in a kitchen to raise funds for him to buy books and pay school fees at Mbumbulu Government School. At the Mbumbulu Government School he passed his standard four with flying colours. The local inspector, Mr Hamilton Makhanya impressed by his performance secured him a scholarship from Adams College near Durban. At the Adams College he trained as a teacher from 1933 till 1935. One of his teachers at the Adams College was Albert Luthuli before he left for the Groutville Mission Reserve to take up his position as Chief. After qualifying as a teacher he started teaching in Natal. Two years later he passed the matriculation equivalence exams with a distinction in Latin via correspondence. From Natal Lembede moved to the Orange Free State to teach there. In the 1930's while was still teaching at the Orange Free State, he enrolled with the University of South Africa (UNISA) to further his studies. At UNISA he managed to obtain his BA and LLB degrees over a duration of six years. In 1943 Lembede swapped professions, he abandoned teaching to become a lawyer. He moved to Johannesburg to serve articles under Dr. Pixley ka- Isaka Seme, the veteran ANC leader. In 1946 he qualified as an attorney and partnered with Seme. In 1945 after submitting a thesis entitled “ The Concept of God as expounded by and as it emerges from the philosophers from Descartes to the present day” UNISA conferred an MA in Philosophy on him. At the time of his death he was studying towards doctorate degree in law. Upon his arrival in Johannesburg Lembede revived his friendship with his old friends Jordan Ngubane and AP Mda. In 1943, his friends Ngubane and Mda initiated Lembede into ANC politics. He was instrumental in the formation of the ANC Youth League in 1944. While he was in Orange Free State, Lembede was exposed to Afrikaner Nationalism. This experience of Afrikaner Nationalism and together with his readings of European philosophy made Lembede well versed in the principles of nationalist ideology. Subsequently in his co-operation with Mda he gradually integrated these ideas into African Nationalism. 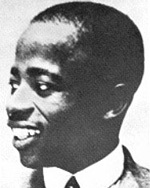 Lembede became part of the National Provisional Committee, which was formed in 1944 to oversee the process of the formation of the ANC Youth League. On 10 September 1944 the Youth League was officially formed and Lembede took over from William Nkomo as the Youth League general president. Nkomo served as the Provisional Chairperson since the beginning of 1944. Lembede contributed immensely in the drafting of the ANC Youth League Manifesto. Lembede also served in various ANC positions. In 1944 he was elected ANC Provincial Assistant Secretary in the Transvaal. Two years later Lembede was seconded to the ANC National Executive Committee and National Working Committee under the leadership of Dr Xuma. In 1945 Lembede, Water Sisulu and Oliver Tambo almost succeeded in persuading the Transvaal Congress to expel the communists from its membership as they were viciously attacking Africanism. He was at the forefront of the campaign by the ANC Youth League to destroy the Natives Representative Council and boycott elections under the Native Representatives Act of 1936. This earned him the respect of ANC leaders such as J.B Marks. He was regarded as the architect of the 1949 Programme of Action. In 1947 Lembede died of an undisclosed illness. His doctors could say nothing apart from saying he suffered from “intestinal malfunctioning”. He was 33 years of age when he died.